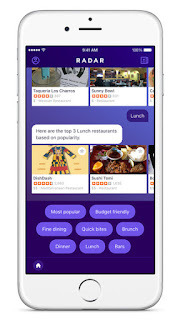 Yahoo releases Radar virtual travel guide app for iPhone. Yahoo today released a new app called Radar on iOS platform. Radar delivers personalized recommendations of sights to see, activities, and restaurants you won't want to miss, sourced from several trusted websites across the Internet. Acting as your smart travel guide, Radar gives you the information you need so you can explore the world around you. Whether you’re traveling, or exploring your native city, Radar makes it easy to have once in a lifetime experiences.